Volvo's Adrian Yeates, Alan Coleman, Mayor Cork County, Royal Cork Admiral Pat Lyons, Minister for the Marine Simon Coveney and Cork week's John Roche from Royal Cork. #CorkWeek – With a fleet of just over 100 boats, yesterday's official opening of Volvo Cork Week at Royal Cork Yacht Club was a proper parade of sail as the competitors readied their vessels for the days of racing ahead. Members of the public turned out in droves to see the boats and enjoy the festivities of Sunday's open day, including fun fair rides and an open-top bus shuttle between the Royal Cork and Camden Fort Meagher taking in the breathtaking vistas of Cork Harbour. 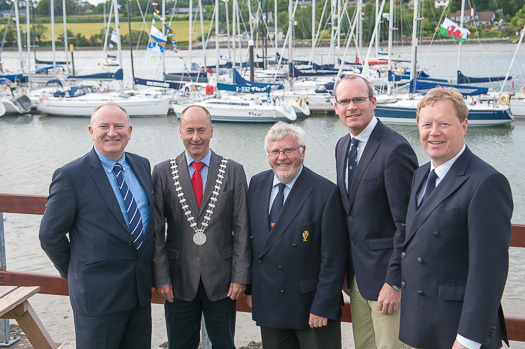 Later came the official opening of Volvo Cork Week by Marine Minister Simon Coveney, together with VCW chair and club vice admiral John Roche and admiral Pat Lyons. But Cork Week is about the action on the water, and it got off to a rapid start yesterday morning with the PYR Race Dash for Cash, which boasted a prize fund of €1,000. The tightly fought battle saw Peter McCann with crew Arran Walsh, sailing a 420, emerge victorious to take the first prize of €500.00. They were followed in second and third place respectively by John Downey and Sandy Remmington, and Alex Barry and Richard Leonard, both sailing RS400s. As previously reported on Afloat.ie, it's set to be a challenging yet rewarding week ahead across the fleets, and particularly so in the big boat class as several Ker 40s will be gunning for new British IRC Nationals champion Antix.